We all recognize the emotions involved when you see that ‘perfect house’! The popular expression tells us, “you can’t judge a book by its cover”, and that’s ever so true for buying real estate! A home inspection can in 99% of the time avoid a messy real estate deal. Yet, one wonders why not every single home buyer (or seller for that matter!) opts to have a home inspection done! Forget thinking you can have a ‘thorough look’ yourself and detect any major problems! I know that many home buyers are quite the handymen themselves, but going into detail like a home inspector does, is a completely different matter! Why can’t one regard such a home inspection as some sort of insurance, to protect against what might or might not be?! You’re getting insurance on your iPhone when you buy a new one, “just in case” something goes wrong! But spending such sums on getting a home inspection report done prior to buying a home is not worth it?! Maybe you haven’t been properly informed why these home inspection reports are so important to you? And how much money you’re going to save by getting a home inspection done! What could possibly be the reasons why you as a home buyer should get a home inspection before buying a house? Not comfortable with the home inspector’s findings? Step away from the deal! 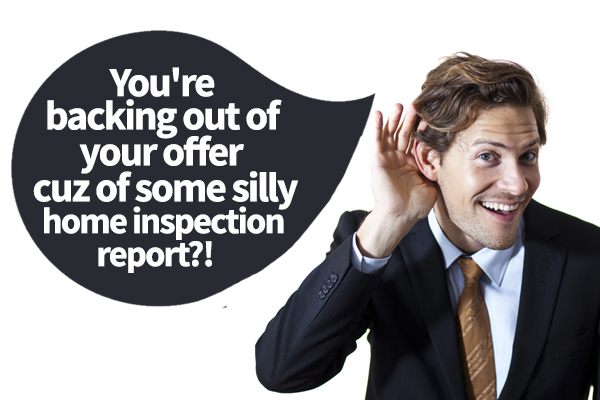 A complete home inspection report could potentially give you enough reasons NOT to go ahead with the deal! What if there are too many critical systems nearing their ‘shelf-life’ expiration date? Are you willing to take on all those extra costs to repair and replace them in a few months? What if the report comes back with structural issues in parts of the house? Are you okay taking those on? A home inspection can honestly save you A LOT of money! Whether it is by revealing all the unexpected costs you might be facing in the near future as the new owner of that house, or whether it is by using the home inspection report as a negotiation tool to reduce the final sales price of getting that house! Either way, the small investment of getting that report can give you huge returns on the initial money layout! Even though you as the home buyer will be able to use the home inspection as your main tool for negotiation, this doesn’t necessarily mean that the home seller will agree with whatever numbers have been put forward by the home inspector. Many times, the buyer and seller don’t come to an agreement who will be carrying certain costs. As the home buyer, you might be adamant that a number of repairs need to be done by the seller, WITHOUT adjusting the sales price, whereas the home seller strongly believes if he were to do those repairs, the price needs to be adjusted downwards! If a stalemate ensues, it will be completely your call if you’re comfortable enough with the negotiated terms on the bigger picture to go ahead with the purchase, or decide to rather back out and continue your home buying search! Thanks to the home inspection, you know exactly what you’re getting yourself involved with! How’s that for being in control of the transaction?! As mentioned earlier, the cost of having a home inspection done is really minuscule relative to the price of the house you’re about to buy! Depending on the size of the house, most home inspections will cost you between US$300 – US$500 (or ZAR3,000 – ZAR6,000). The home inspection report you will get back is extremely detailed and is backed up with lots of photographic evidence of every single item discussed in the report. Some reports can be up to 50 pages long! In my experience, those home buyers who decide not to go ahead with a home inspection, do eventually regret their decision as there’s always something somewhere that comes out of hiding! Whilst it might not be something the home seller was aware of at the time of the sale, nonetheless it has now become the new homeowner’s problem! Yet, it is something which could easily have been tackled earlier if you had known about its existence ahead of time! The only time a home buyer might decide not to get a home inspection done would be in a situation of multiple offers on a house. It’s obvious that the more attractive offer will be accepted by the home seller. In the event of your offer being contingent on a home inspection, you’re likely going to miss out against the competing offer which might not have any mention of a home inspection! Buying a property without having a home inspection is almost the same as driving your car blindfolded! You’re still moving forward, but have no real idea where you’re going to land up! Can you say with absolute certainty that your new home doesn’t have any mold? How about carbon monoxide of poorly installed or maintained household appliances? It is rather amazing how many hidden defects, known and unknown to either party, can suddenly rear its ugly head! Are you willing to jeopardize the safety and health of yourself and your loved ones? The home inspection report will cover any of those concerns, and more than likely come up with suggestions how to tackle the potential problems and its likely cost. A few years ago, I was unaware that the house I had just sold actually only had proper permits for 1/3 the size! Can you imagine the home buyer’s reaction when we found out? Most home buyers (as well as real estate agents) might initially not be able to detect any illegal additions or installations. One might have some suspicion that there were a few changes done over the years, but unless a home inspector has a good look at the house, one cannot be 100% sure. A home inspection can detect whether there are any structural issues! While we can all get on our knees and start having a thorough look at some of the inside / outside walls to determine whether’s anything worthwhile noting, it does take a professional to detect any potential structural issues! Certain large cracks in the walls, door frames or ceiling, which were quickly explained away by the home seller at the time of mandate signing, might actually turn out to be a serious structural problem, where some handfuls of spackling paste won’t do the trick to make it all go away. A home inspection will discover such any potential red flags such as structural issues! Some areas of the country lend themselves to more foundation issues than elsewhere, so needless to say, given the importance of a property’s sound foundation, failure to pinpoint any outstanding issues will result in a very expensive exercise to remedy those problems. Keep in mind that it’s not always the “fault of the house” settling in after its initial construction, sometimes it’s just poor workmanship, where something was incorrectly installed or defective materials were used! How can the home buyer possible know how long some of those major critical systems have been around for? When were they last maintained? When will they likely need to be replaced? All those questions, and more, can be answered by the home inspection report! Any experienced home inspector will be able to diagnose the situation of the individual installation, and determine whether maintenance is long overdue, or has been taken care of quite recently. More importantly, the home inspection will also give you a good idea how long one still has before the current appliances need to be replaced! Having these detailed assessments done beforehand will allow you as the home buyer to budget any future maintenance costs as total cost of homeownership! Are too many of these major installations coming to the end of its shelf-life at the same time? Does the purchase price suddenly not look as attractive any more? A home buyer will get invaluable maintenance feedback from the get-go before he gets involved and put his hard-earned money into a property, which is going to cost him a lot more than anticipated! While there will always be unexpected expenses or repairs to be done when you’re a homeowner, as a home buyer you rather know ahead of time if certain expenses ought to be adjusted for in the purchase price. There’s no doubt about it: having a full home inspection report done prior to buying the property will allow one to negotiate from a point of strength! Any requests for repairs by either party, following the home inspection report will be easier to handle vs. trying to determine the severity by having all parties using their personal ‘expertise’ to come up with potential costs. However, home buyers can’t expect to use the entire home inspection report as an excuse to justify for the seller to fix every single problem in the house, especially when they were known beforehand. Any experienced real estate agent will have already explained this to his client, in conjunction with the warning of an unlikely positive outcome if one were to proceed as such! In the end, having a home inspection done only benefits one’s negotiation power! Peace of mind knowing there aren’t any hidden problems in your new home! Those of us who have purchased property before know how stressful the home buying process can get! Why add on any unnecessary stress by purchasing a house which may or may not have hidden defects, structural problems, potential safety issues or illegal additions?! All those worries can simply be taken away by getting a home inspection! Imagine getting involved in a purchase transaction of your personal home where you know way in advance of the existence of any issues or problems, potential repairs, maintenance, leaks etc.!? In six months’ time, you’ll likely have to replace some of the filters; by year’s end, it would be advisable to have your A/C unit serviced, etc. A home inspection will result in you knowing where the ‘weaknesses’ of the house are; the really true condition of the house! Over time, there’s no doubt that home inspections will be required by law. Until then, it will be up to each and every home buyer to determine whether he is comfortable enough getting financially connected to a house for the next 10, 20 or 30 years, without doing a home inspection! Feeling comfortable in your newly-purchased house will make it that much easier to call it your home! Hopefully, the above 8 reasons have given you enough ammunition to insist on having a home inspection done next time you’re thinking of buying a house! Knowing ahead of time what you’re getting yourself involved with can only bring you peace of mind that this gorgeous house you fell in love with, is actually perfect for you! If you think this article was an interesting read, please share it across your social media platforms! About the author: The above article “8 Reasons To Get A Home Inspection Before You Buy A House” was written by Xavier De Buck, your top-producing Johannesburg real estate agent. Xavier has been nationally recognized and awarded for providing service excellence, exceptional property sales, whilst exhibiting the highest level of professionalism. With over 15 years combined experience as a real estate agent and real estate investor, if you’re thinking of buying or selling a home in Johannesburg, Xavier would love to share his property knowledge and expertise. Xavier has more than 60,000 followers on Facebook, Google Plus, Twitter, Pinterest, and LinkedIn. Real Estate’s Dirty Little Secret And Why It’s Costing You Money!